Solo album - hmmmm, more like a group project featuring the musicians of Aisling, Sid Omasta, and Rick Nelson. The good news is that all the tracks have been recorded now. The album title will be "An Obair," which is the Gaelic term for "The Work," and it is also the name of the town where Turlough O'Carolan was born. There is a nice variety of music on the project: music by Turlough O'Carolan, some original tunes, traditional Irish tunes, and vocal tracks. Look for it to be released at the Dublin Irish Festival. It will also be available at CD Baby - stay tuned for news. Andi Wolfe at the mic (triple harmony, anyone?). Most of the tracks feature Andi's hammer dulcimer playing, but she also played fiddle, bodhran and some interesting African percussion instruments. 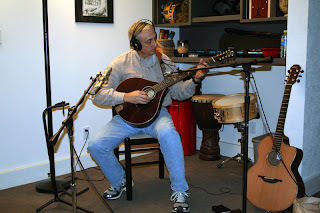 Craig Caldwell on bouzouki. Craig did most of the guitar tracks and added mandolin to the mix. 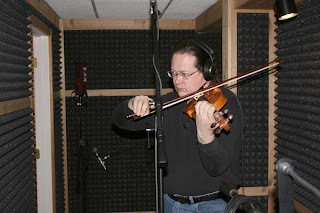 Stuart Brand played some interesting violin parts ("Let's see what I can butcher together on the fly. . . ."). He also made his whistle debut on this project. 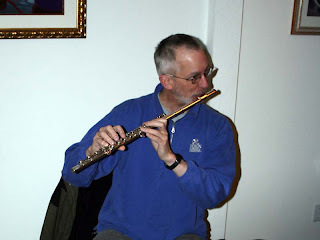 Steve Wolfe on flute and tin whistle. Mary Bertke added some vocal harmony and banjo parts. 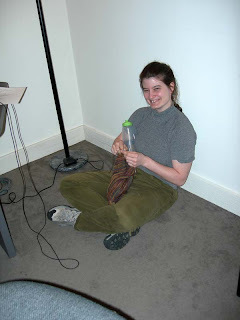 She was furiously knitting a sweater to try to have it finished before she headed over to the UK for a vacation.